With Desert X returning to the Valley in 2019, all eyes will be on installations scaled to Instagram. In the shift to Insta-art, those who work in the enduring tradition of 20th Century Impressionist painters are easily overlooked. One such “slow artist” who has long explored the power of the local landscape is Elaine Mathews. She keeps returning each fall to Whitewater, Araby Wash and other perennial locations, despite the influx of mirrors and robots. In an acknowledgment of her dedication, she has been chosen as the poster artist for the 37th Annual La Quinta Arts Festival, March 7-10, 2019. 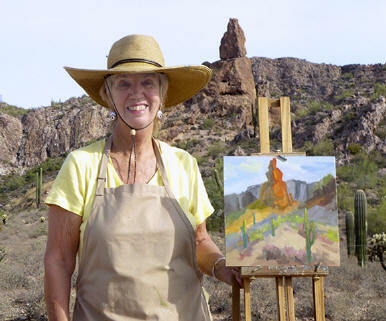 Elaine Mathews painting in Andreas Canyon. Photo by Christy Porter. Another of our most dedicated slow artists is Diane McClary. 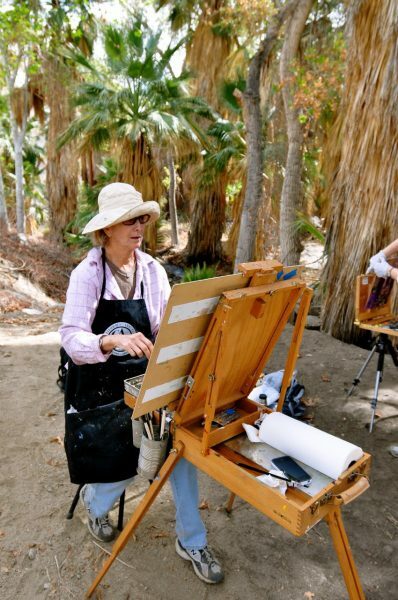 Like Elaine Mathews, this La Quinta Cove resident has painted the oases and canyons each year, acquiring knowledge that only comes from sustained acquaintance. It comes as sad news for her friends and fans that McClary has suffered recent health problems and now requires an assisted living arrangement. She’s decided to retire from painting. 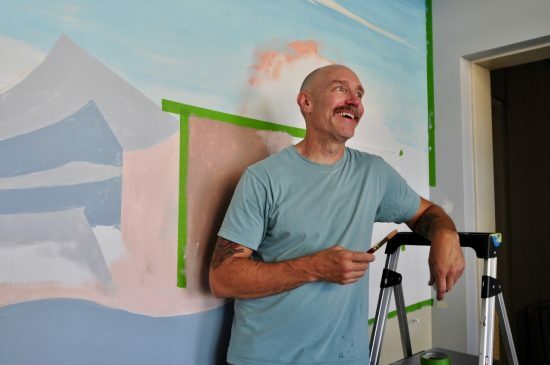 Warner Graves–who divides his time between Cathedral City and the Bay Area–is known as a painter of large scale murals on the walls and ceilings of private residences. His grandmother, Lula Mae Graves, was an early desert photographer in the Salton Sea region. In recent years Graves has taken up desert painting and is returning to the places his grandmother documented almost 100 years ago. Agnes Pelton has been our local hero but she’s about to leave the nest in a big way as the Phoenix Art Museum retrospective evolves. The latest tour stops include the New Mexico Museum of Art in Santa Fe and the Whitney Museum of American Art in New York. In the next two years, watch for more people to jump on the Pelton bandwagon as humble Cathedral City garners national attention for its early arts scene. 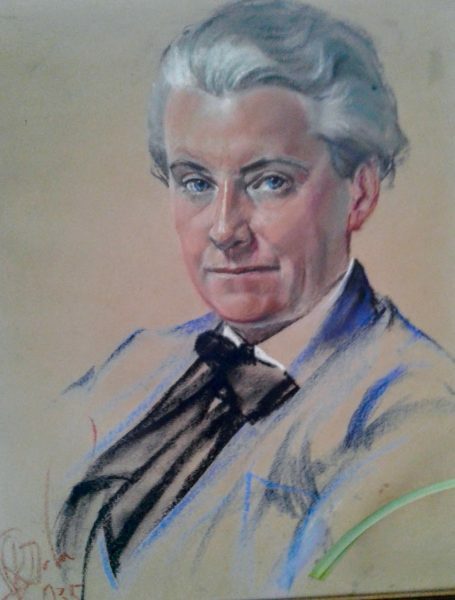 A neighbor and friend of Agnes Pelton, Matille Prigge Seaman–known as Billie– was one of the earliest artists to settle in Cathedral City. A self-portrait of her has surfaced, thanks to Paulina Dellosso. Paulina’s late partner Jeannie Parker was friends with Billie in Cathedral City and inherited some of her paintings, as well as her prized derringer. This revealing self-portrait hung on the wall of Jeannie Parker’s room in a nursing home until her death in February, 2016. The ever-popular Agnes Pelton also makes an appearance in a new exhibit at the Pasadena Museum of History, inspired by Maurine St. Gauden‘s four-volume work Emerging from the Shadows; A Survey of Women Artists Working in California, 1860-1960. The 250 works in the exhibit highlight historically important yet underappreciated artists–a favorite theme of this website, as well. Some of the artists displayed–Pelton, Helen Lundeberg and others–were energized by the desert landscape. The exhibit aims to show “that women could and did contribute to the evolution of style, technique and exploration” in the world of California art. 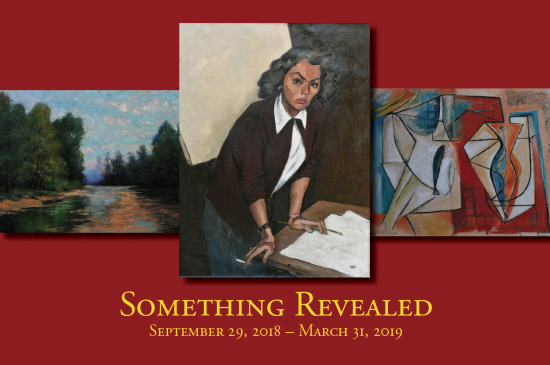 Something Revealed: California Women Artists Emerge, 1860-1960 is on view through March 31, 2019. 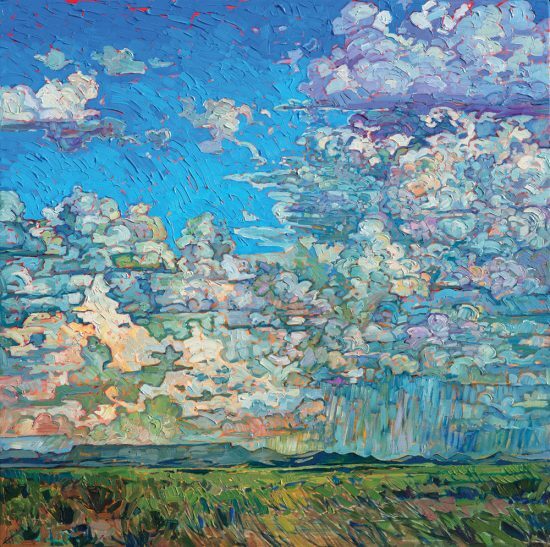 The rock climber and artist Erin Hanson continues to explore the deserts of the Southwest in her newest exhibit Impressions of Big Bend Country at the Museum of the Big Bend in Alpine, Texas. Her expanding desert oeuvre is inspired by hands-on knowledge of the sand and rock as she backpacks, hikes and climbs her way through places like Red Rock Canyon, Monument Valley, Death Valley, Anza Borrego and the Coachella Valley mountains. The Big Bend exhibit features blooms, canyons, rivers and big vistas. Hanson is a painter who long ago set her vision on something most of us can’t see and never veered from course. Experience the natural world through the evolved style the artist calls Open Expressionism. Impressions of Big Bend Country is on display through December 16th, 2018. John Bascom is a tireless publicist for his late father, rodeo cowboy and cowboy artist Earl Bascom. He’s currently lobbying for a last minute save for the historic Victorville ranch–dating to 1872–where his father once lived. The ranch is due to be destroyed October 11th, 2018 in a fire-training exercise. Fred Bosch once owned the ranch at 15669 Stoddard Wells Road. He and Albert Einstein were friends in Germany and Einstein visited the Victorville ranch to sunbathe and swim in the reservoir. 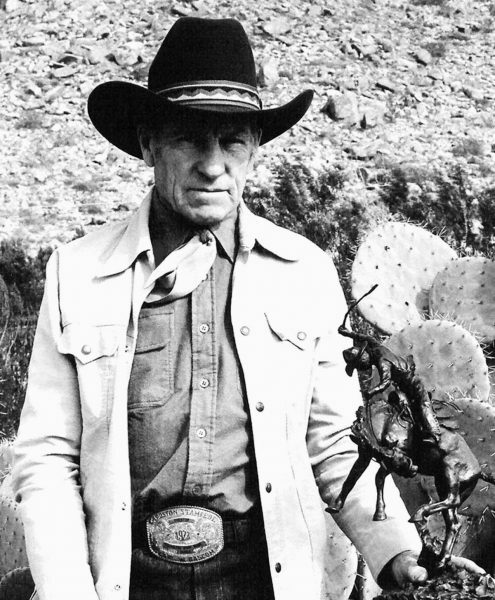 Well-known desert artist and cowboy Bill Bender lived and worked on the ranch, along with Earl Bascom, another cowboy artist best known for his sculptures. In 1975, after Bascom purchased the property and set up his painting and sculpture studios there, it became known as the Bascom Ranch. Prospector Bill McHaney Immortalized in Chuck Caplinger Poster. Chuck Caplinger, an artist recently featured here, designed the poster for this month’s Pioneer Days Celebration in Twentynine Palms. His painting of a tool-laden Bill McHaney is from his series on Hi-Desert settlers, miners and Chemehuevi Indians. The painting will be featured in the exhibit Into the Wild–artists interpreting adventures in the desert wilderness–at the Twentynine Palms Visitor Center and Art Gallery. Posters and buttons of the Bill McHaney painting will be available at the visitor center during Pioneer Days (October 18-21, 2018). 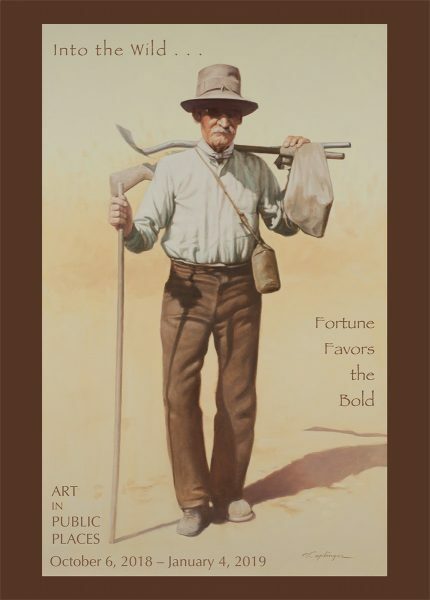 Grab your own Chuck Caplinger poster to honor this desert artist pioneer as well as early basin settlers. Into the Wild is on display through January 4, 2019. The visitor center is open daily from 10 a.m. to 4 p.m. at 73484 29 Palms Hwy. at the corner of Desert Queen Avenue in downtown Twentynine Palms. For questions or directions, contact the visitor center at (760) 367-3445.
john bascom and his ranch are in my prayers! for not!!!! possible burn down conditions and very helpful people, to save his father’s most historic ranch asap! cannot help but “hope” your wonderfully inspiring episodes, dear ann, have propelled agnes pelton-ness to those who make things happen! healing prayers for diane mcclary! thank you for keeping the desert art light scintillating, dear ann! Thank goodness there are still slow artists who paint in the California Impressionist Tradition. We will be at the paint-outs you list above. I’ve known Elaine Mathews for several years now and her paintings are incredibly beautiful. We are very proud of her selection as the La Quinta 2019 Poster Artist. I will be showing at the Rancho Mirage Art Affaire again this year and will have many paintings of our desert there.